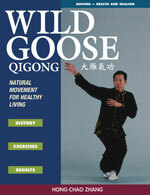 We found a lot of books that mentioned dayan qigong or wild goose qigong - but most of them mentioned it in passing as a comprehensive and complex set. 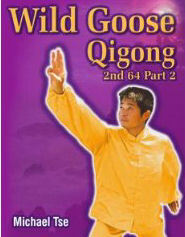 Others used one or two of the moves to illustrate points of qigong practice. The ones listed have wild goose as their main theme. The first and second 64 movements are illustrated with line drawings. Descriptions of the second 64 movements in English are hard to find. Mostly unavailable from the big booksellers - think second hand. 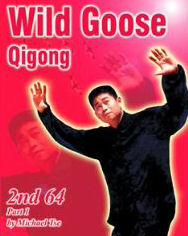 This book contains the first set of 64 Actions of Da Yan, or Wild Goose, Chi Kung - one of the most popular sets in China. It includes 77 diagrams and detailed explanations of the movements, along with guides for practice and information about the exercises from the Traditional Chinese Medicine perspective. Michael Tse studied with Yang Meijun. Anecdotes of Yang Meijun. Five element theory. The 64 dayan qigong movements are illustrated with line drawings of Michael Tse. Interspersed are line drawings showing acupressure point details. Appendices give overview diagrams of acupressure points and a cross-reference of their names in Mandarin, Cantonese and English. Book 1 Pages 56 - 123 cover movements 1 - 37 of the 2nd 64 set with line drawings of Michael Tse. Book 2 Pages 95 -167 cover the remaining movements. YMAA Publications, 2000. ISBN: 1886969787. 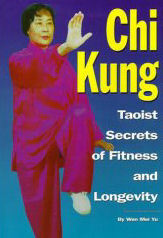 A very brief overview of qigong history followed by the effects of qigong on the body. 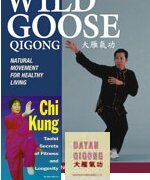 Pages 19 to 102 cover the 64 movements illustrated by photos ( about 227) of Hong-Chao Zhang and an explanation of the benefits of the dayan qigong move. For example movement 4 - fold the nest is said to be good for eye disease and and poor digestion. Covers the development of wild goose chi kung and moves on to the meridian channels and acupoints involved using old fashioned line drawings. Also covers five element theory and the basic hand forms. Chapter 7 page 70 - 164 has the descriptions of the moves with about 3 black and white photos per page for illustration.